With The Ultimate Body Applicator, results are progressive. With each treatment you will be more pleased with your results. Your skin will look and feel smoother, younger, more toned, and tightened. A once a week application is recommended for continuous, progressive results and for ongoing maintenance. The more consistent and diligent you are in applying the Ultimate Applicators the better the results! The Ultimate Applicator is successful for the majority of users the very first time it is used. Botanically-based formula will deliver you maximum tightening, toning, and firming results where applied to the skin. Skin can look hydrated, more youthful, with improved appearance of body contouring and cellulite. Although most begin to see improvements after the first application, some may take up to 3-4 applications to achieve optimal results. Everyone’s body is different, and if you have small or clogged pores it can affect your ability to see results with the Ultimate Body Applicator. If you have small or clogged pores, we recommend that you use our Cleanser Gel to remove impurities from the skin as well as an exfoliator to help remove any dead skin cells that may be clogging your pores and preventing you from absorbing the lotion formula. If your diet or lifestyle is unhealthy, you may also bloat at first. Drinking lots of water will assist in helping you start seeing results. Look at these amazing results below! 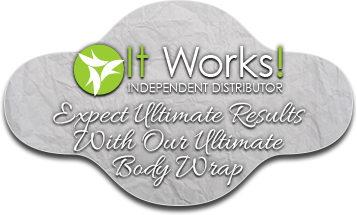 Each before and after is from ONE wrap!